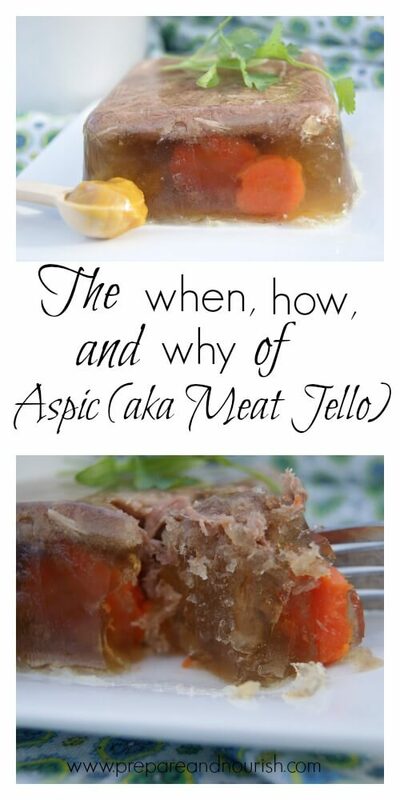 Meat jello or Aspic, as it is formally called, is rich in amino acids and nutrients. 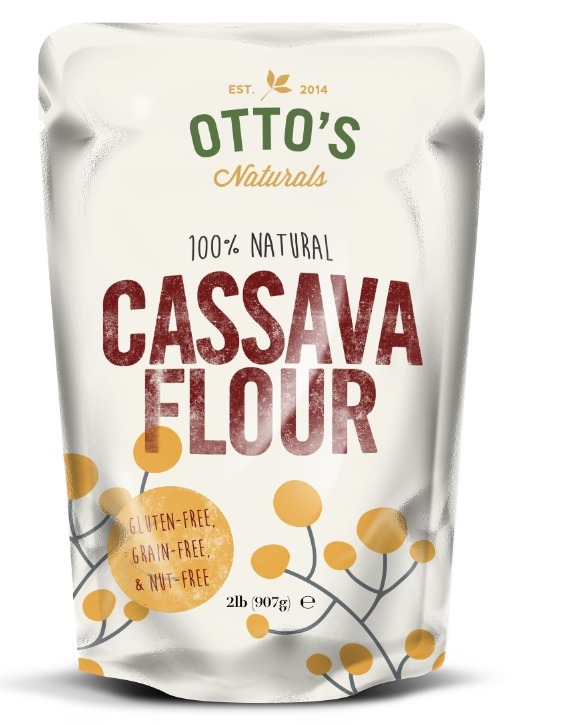 It’s naturally a great source of collagen and helps support bone, teeth and joint health. 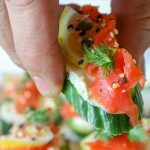 It’s naturally Whole30, Keto, Paleo and GAPS diet compliant. 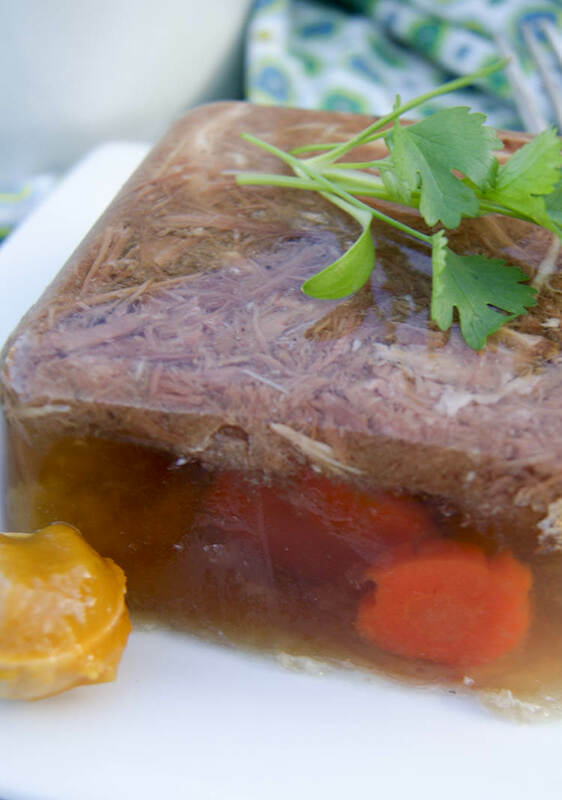 Meat jello dates as early as 1375 when the original and detailed Aspic recipe was published in Le Viandier, a collection of the best known recipes of the Middle-Ages. Two years later, he sold his formula to the tune of $450. Today, Jell-O is the largest selling desert and is known worldwide. We don’t consume Jell-O in our house and whether or not you do, that’s your choice (but I highly discourage that you do). What we do eat instead is real and pure gelatin. For instance, this nourishing and delicious aspic. Note: For jelly-type recipes, we use grass-fed bovine gelatin and collagen products from Perfect Supplements. They carry high-quality collagen products and are leaders in the industry. 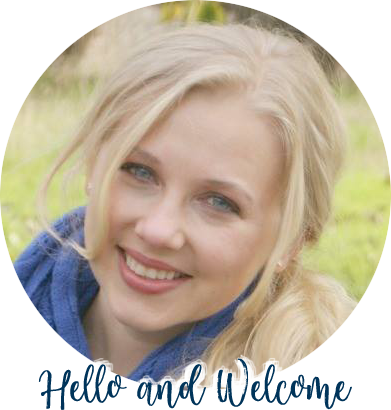 Click to see what my favorite gelatin products and how you can save on all your purchases. 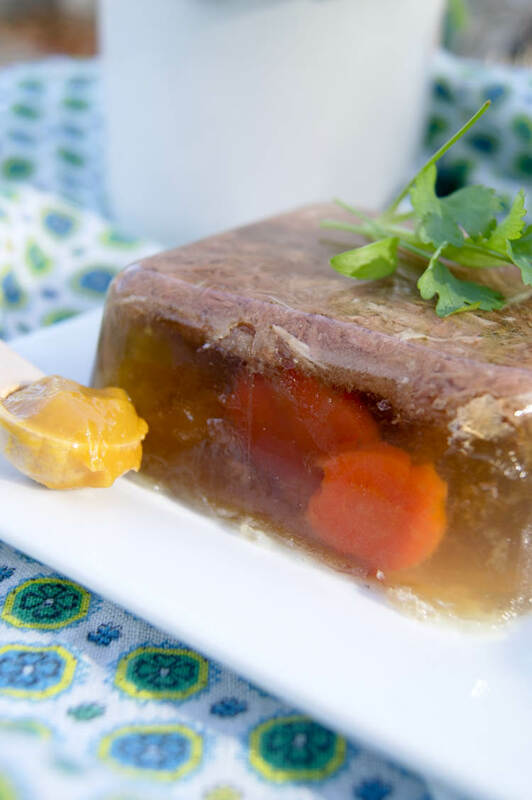 I like to think of Aspic or Meat Jello (Holodets in Russian) as glorified bone broth. 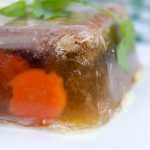 And it makes sense as the technique and ingredients used in making bone broth are also similar to aspic. Only with more meat. In fact, back in the Le Viandier recipe, aspic was used to preserve vegetables, meat and eggs. Of course with the advent of modern-day refrigeration, we don’t need to “preserve” vegetables in meat gelatin. 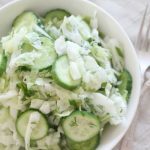 When making aspic, you want to use the purest ingredients as the slow and long cooking process extracts minerals out of bones and other animal cuts. And by purest ingredients, I mean grass-fed beef or pastured or organic chickens and free from hormones and antibiotics. 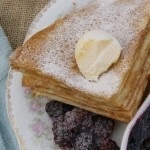 The best part about this recipe is its’ nutrient content. 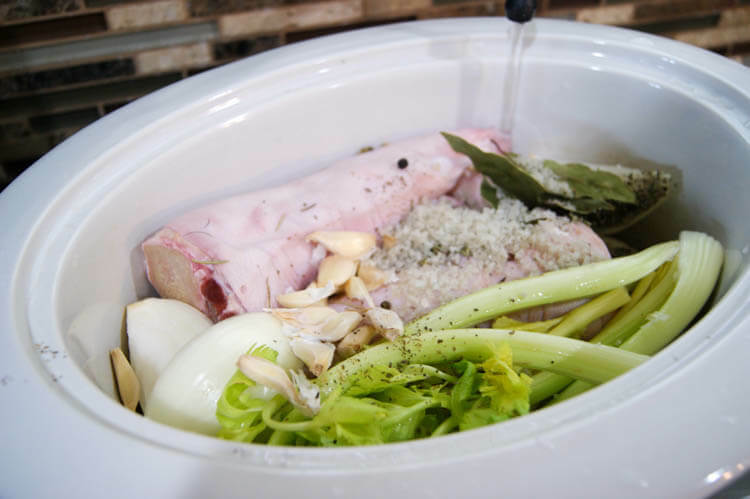 When you cook bones for an extended period, you are breaking down the collagen, protein found in bone, marrow, cartilage, and tendons and that process produces gelatin. Gelatin is responsible for aiding protein absorption and soothing the gut lining. 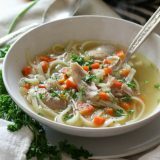 That’s why Chicken Noodle Soup is so nourishing for your gut when you are fighting a virus. 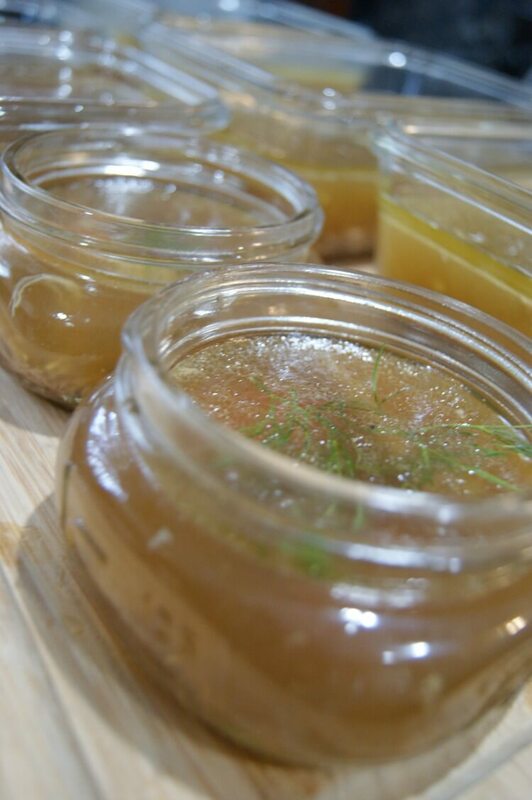 The collagen/gelatin factor in bone broth or aspic can also make your skin supple and reduce cellulite. 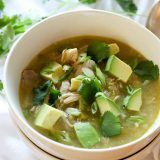 Another benefit of bone broth is the healing properties in the form of amino acids that they contain. 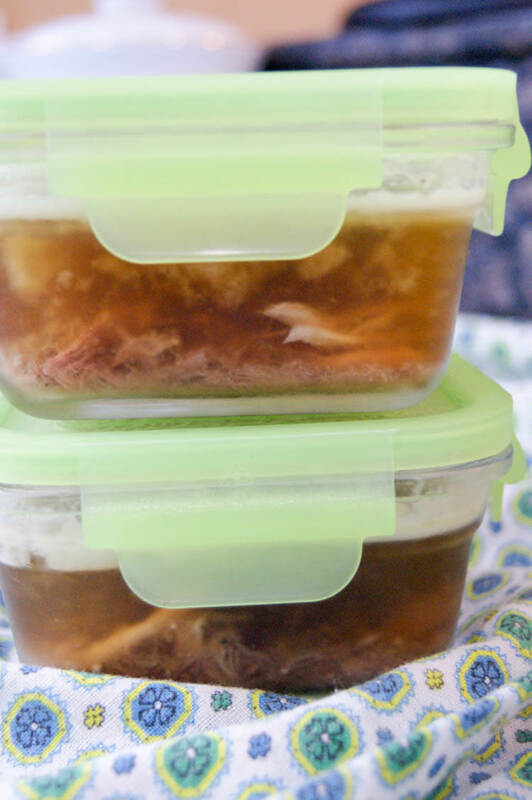 There are numerous benefits of bone broth and aspic so it’s a given you should have this superfood in your kitchen at all times but I’ll be honest with you, I don’t care for making it. That’s why I prefer my slow-cooker to do most of the job. 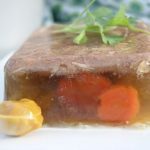 This aspic recipe is made out of pork trotters (pig feet) but the meat can be whatever you have on hand. I’ve used leftover turkey from Thanksgiving, or leftover roast chicken meat, or leftover slow-cooked rump roast. Did you catch the theme? Any leftover meat will work. 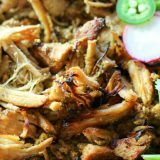 Toss all ingredients, except the cooked meat into the slow cooker. 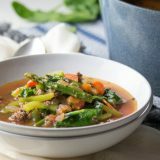 You can add whatever veggies you typically use when making bone broth. I like celery, onions, carrots (though I add this later) and lots of garlic (with skins). For spices, I used a combination of bay leaves, peppercorns, rosemary, oregano, basil, and of course my favorite coarse salt, Celtic Salt. Turn the slow cooker on high and bring to a boiling point. When it reaches a gentle simmer, add carrot and reduce heat to the lowest possible setting and cook for 8 hours (I usually leave this overnight and process it in the morning). By now, the pork trotters should be falling apart and you should have a very rich, gelatinous bone broth. Divide previously cooked meat of choice in small ramekins or other glassware containers such as pint-size mason jars. Double strain the broth into a large bowl (I like using this for ease and simplicity) making sure you’re left with very clear, clean golden liquid. If you don’t have a fine-mesh sieve, spread a cheesecloth on a regular sieve to catch all herbs and other debris. Add fresh minced garlic to the broth and pour into the containers. 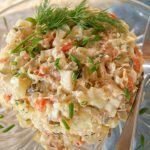 Add a slice of cooked carrot to each container for garnish and dill or parsley. Discard pork trotters and veggies as you would when making bone broth. Set aspic in the refrigerator for at least 4 hours. Traditionally, aspic should be served with dijon mustard or horseradish paste. If you’re going for convenience, small jelly jars or other small containers (with lids) works best. 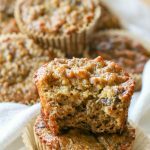 It makes for an easy lunch packing during hectic mornings. 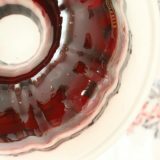 If you’re wanting to impress your friends and family, perhaps a bundt pan would look extra fancy. Toss all ingredients but carrots and cooked meat into a slow cooker. Divide previously cooked meat of choice between small containers. Double strain the broth into a large bowl making sure you’re left with very clear, clean golden liquid. 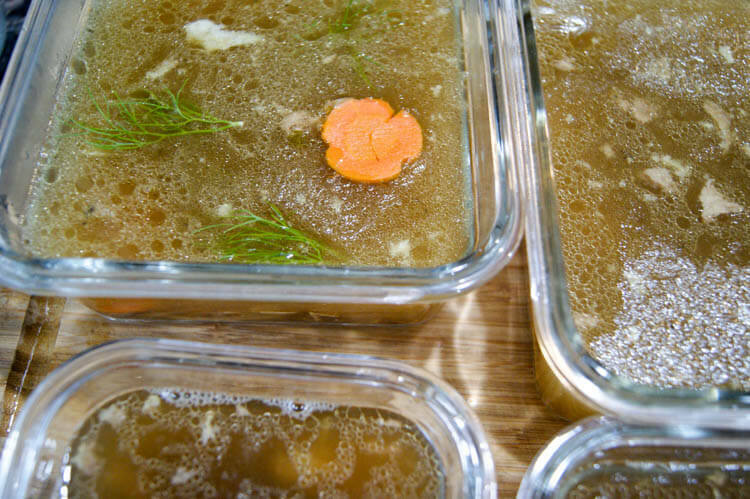 Discard pork trotters and veggies as you would when making bone broth (chickens, compost, or trash). Add 2 cloves of fresh minced garlic in the broth and pour into the containers. Add a slice of cooked carrot to each container for garnish and dill or parsley. Set aspic in the refrigerator for at least 4 hours. It’s best served with rye bread and Dijon mustard. Have you made aspic before? What did you put in it? Want an extra dose of collagen in your diet? 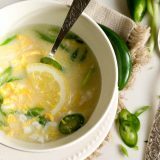 Find out how to get more of the gut-healing, amino-acid, nutrient-rich collagen and gelatin HERE. 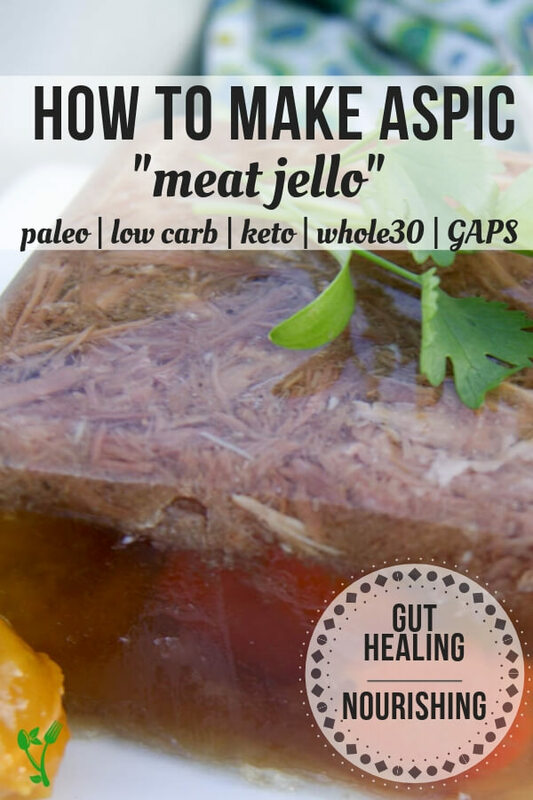 How interesting, I’ve never heard of meat jello before! Thanks for sharing at Merry Monday, hope to see you again next week! Instructions are very good, but you never say how much water you pit in your slow cooker. 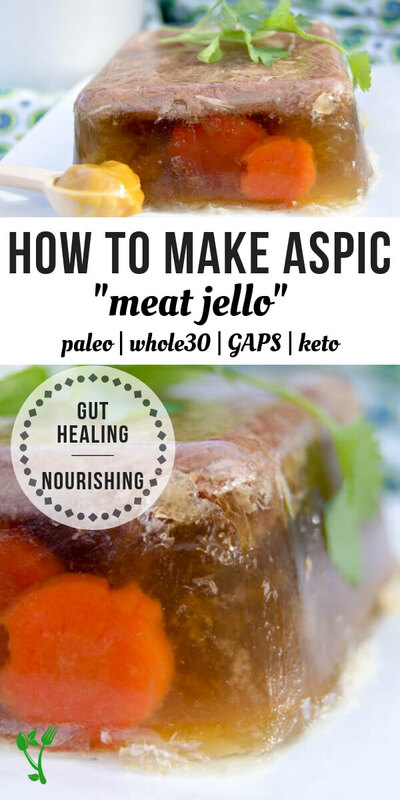 I’ve got to admit I looked up aspic because I saw it on a TV show and it sounded horrible, but I’ll try anything once. Save tripe. Not for a million anythings! You would fill up to the max line in your slow cooker, generally going for 1:1 ratio of meat/veggies to water. In an average slow cooker you’re looking at 3-4 quarts of water. Hope that helps. 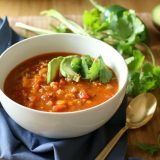 Whatever is used to parse the recipe and display it in a separate colored box is not processing the anchor tags for the links in the notes section. I see that Jon. Will fix it. 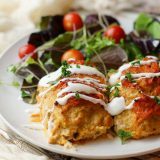 Go Hungarian and sprinkle it with salt and sweet Hungarian paprika before eating. Great to know, Rick. Thanks for sharing. This is a nice set of instructions. I went to france about 15 years ago and was served a sliced vegetables in aspic i want to recreate. One small note, is that in addition to the information about cooking, about which you clearly have a lot of information, there is also a lot of pseudoscience/health information. 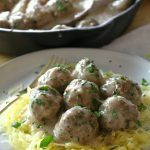 For example, “The collagen/gelatin factor in bone broth or aspic can also make your skin supple and reduce cellulite.” I’m not sure if the author just made this up, or found it on some disreputable site, the web is full of misinformation. 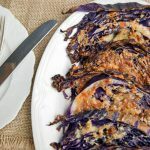 People should be more careful to write what they know, which you have done carefully for the recipe portion. 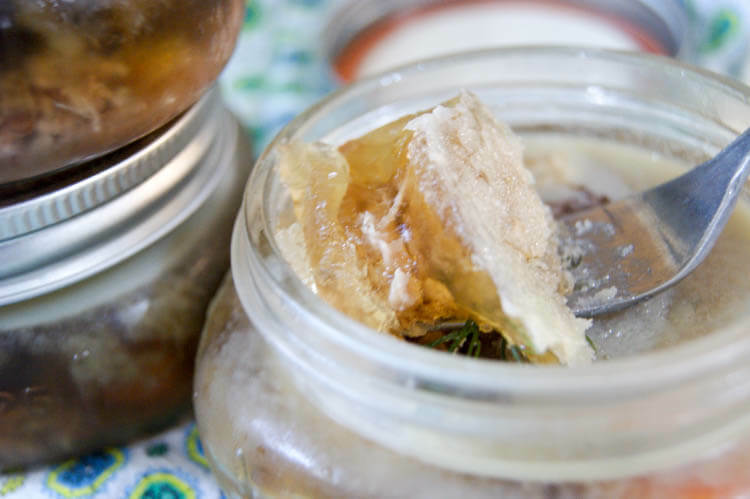 Would you freeze the ramekins or jars of aspic? Hi!! 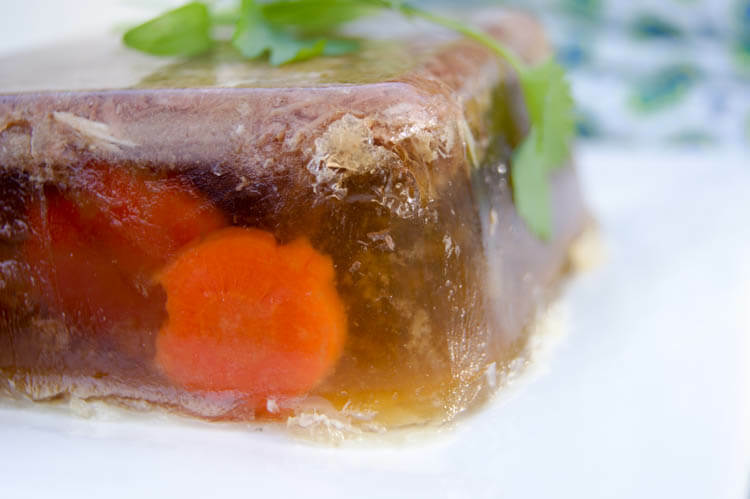 I have not tried freezing aspic but I don’t see why it wouldn’t work (unless you use lots of uncooked veggies in the aspic). If freezing, use wide-mouth pint jars with an inch of headspace. Let us know how it works out. Thanks for the info, I love the jelly around pork pies and sometimes found on pate! 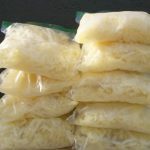 I make up gelatin to freeze to add to soups, stews, curries, etc. but have never used it in a cold dish of my own making, how long do your aspic pots last in the fridge, and do you have any hints on “best practice” regarding the preparation and usage of the meat and veg you use when you say you have used leftovers. 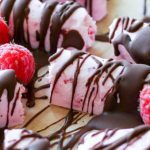 I don’t store any ready to eat prepared foods (even in the freezer) as I always worry about food poinsoning, so I get anxious about leaving anything in the fridge for more than two days! The effort to produce these lovely looking and tempting jars of goodness is a lot to go to unless they have a longer expected fridge life than a couple of days. Hope you have dogs to discard your used trotters to, it seems such a waste! I make them into barbeque spare trotters, once the gelatin is strained off, I put my very simple barbeque sauce (marinated ginger, sugar, soy sauce, anise, oil with a little of the gelatin left in the pot) and return the trotters to a hot grill to reheat, turning occasionally, very sticky, very luscious, yum! (I do discard the pigs nails as I just never fancy them though).